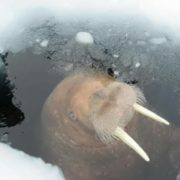 Walrus lives in the cold Arctic seas of Europe, Asia, and North America. 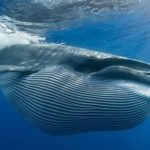 Its name is an English version of the Scandinavian word hvalros, meaning “whale horse.” This animal has a stocky body topped by a rounded head. 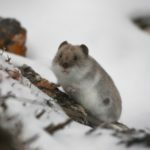 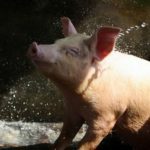 It has small piggy eyes and its mouth is covered with stiff whiskers. 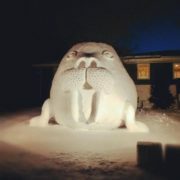 Every year, the walrus grows a new set of whiskers. 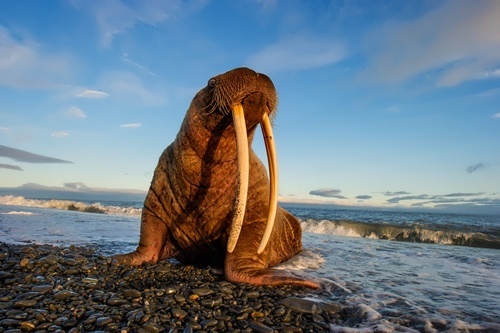 All walruses have long tusks, which they use to fight, cut holes in ice, and pull itself out of water. 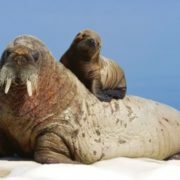 These animals spend nearly whole life at sea and climb onto ice or rocky islands to rest and to have babies. 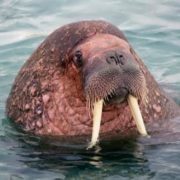 The walruses swim with the help of flippers and also use them to walk. 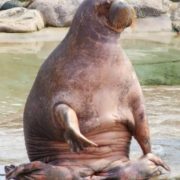 Their swimming speed is approximately 10 km/h. 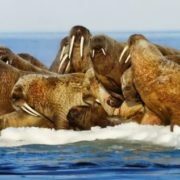 A thick layer of fat below the skin, called blubber, keeps the walrus warm. 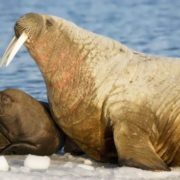 They feed on fish, clams and sometimes young seals. 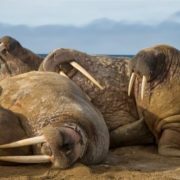 They dig clams from the seafloor with their tusks. 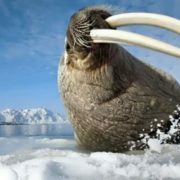 They shovel food into the mouth with their whiskers. 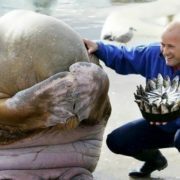 The walrus usually does not chew its prey, but swallows it whole. 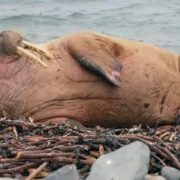 Walruses sometimes also capture and eat sea birds. 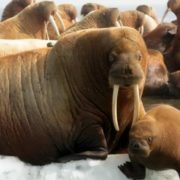 Walruses live in groups of more than 100 members. 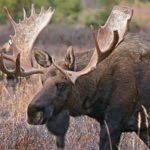 Males are larger than females of the same age. 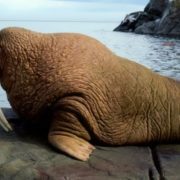 Adult male walruses have an average body length of around 320 cm and weigh 1200–1500 kg; adult females have a body length of around 270 cm and weigh 600–850 kg. 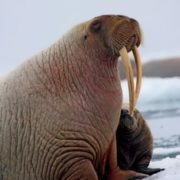 Males have longer and thicker tusks than females. 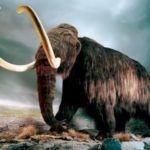 The tusks grow throughout life. 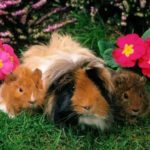 The fur is very short and is absent in some areas of the body. 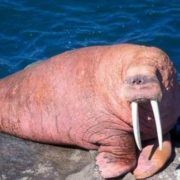 Walruses can sleep and swim at the same time. 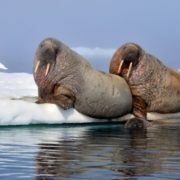 Females give birth to a single calf of around 60 kg and 120 cm in length. 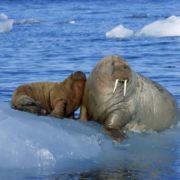 Calves remain with their mother for two years. 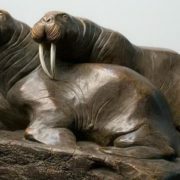 There are two types of walruses – the Pacific walrus and the Atlantic walrus. 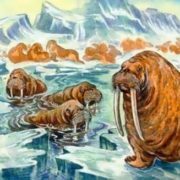 The Pacific walrus is heavier and has longer tusks. 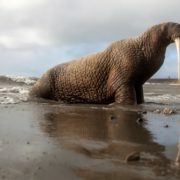 The Pacific walrus is principally found in the Bering Sea south to Bristol Bay and Kamchatka, and in the Chukchi Sea, although in summer it may enter the Beaufort Sea and East Siberian Sea. 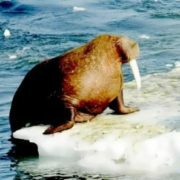 The Atlantic walrus is found in the western and eastern Atlantic Arctic. 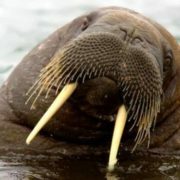 Walruses can reach an age of 30 to 40 years. 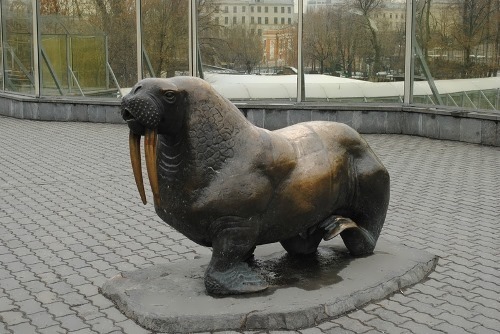 The Walrus Day is celebrated annually on November 22.